This guide focuses on computers with a standard BIOS. If your computer has a UEFI bootloader read this guide instead. In the search box at the bottom of the screen type “System Information” and when the icon appears at the top click on it. Halfway down the right panel there is an item called BIOS mode. If it says Legacy (or anything other than UEFI) then this guide will work for you. Click here for my guide showing how to backup Windows 10. I prefer to use the Win32 Disk Imager tool for creating Linux USB drives as it generally provides a good success rate compared to other tools. You will obviously need a USB drive for this purpose. If you would prefer to, you can buy a USB drive with Ubuntu already installed on it. If after you have finished installing Ubuntu you want to get your USB drive back to being a blank drive again follow this guide which shows how to fix a USB drive after Linux has been installed on it. If your computer only has one hard drive you will need to shrink your Windows 10 partition in order to make space for Ubuntu. Click here for a guide showing how to shrink your Windows 10 partition. Make sure that the Ubuntu USB drive is plugged into the computer. The main installation of Ubuntu is the same for BIOS and UEFI based machines.To start the installation click on the “Install Ubuntu” icon on the desktop. This is the beginning of the installation process and you can select the language which is used to help you through the process. Choose your language and click “Continue”. The installer has changed a little bit for Ubuntu 16.04. The pre-requisites screen has been removed as has the option to connect to a wireless network prior to installing. The preparing to install Ubuntu screen now simply lists the option to download updates (which is only available after you have an internet connection) and the option to install third party software for playing MP3 audio and watching Flash.If you have a decent internet connection then you might wish to install updates during the installation. To connect to the internet click on the network icon in the top right corner and a list of wireless networks will be listed. Click on the network you wish to connect to and enter the security key when prompted. 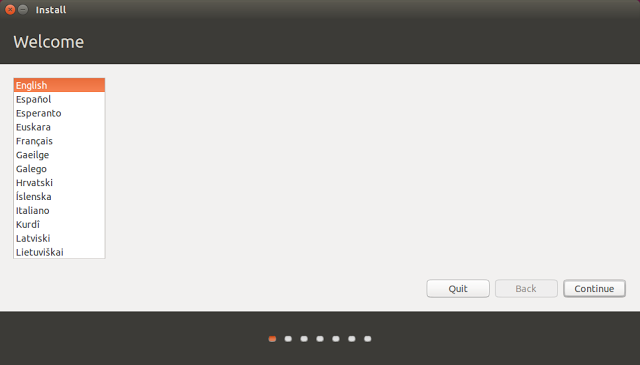 You will need to click the back button on the “preparing to install Ubuntu” screen and then click continue again when you are back at the welcome screen. If you have a poor internet connection then I would choose not to connect to the internet. You can update your system after it has been installed. You can choose to install the third party tools for playing MP3 audio as part of the installation process now by checking the box or you can do it after the system has been installed. The “Installation Type” screen lets you decide whether you want to install Ubuntu alongside Windows or over the top. Choose the “Install Ubuntu alongside Windows Boot Manager” option. A window will appear showing you what is going to happen to your disk. By default the Ubuntu installer will create an ext4 partition for Ubuntu and all of your personal files and a swap partition used for swapping idle processes when memory gets low. In order to set your clock correctly a map appears requiring you to choose your location. Click where you live on the map or start typing it into the box provided and then click “Continue”. Select your keyboard’s language in the left pane and then the actual physical layout in the right pane. Alternatively click on the detect keyboard layout option and it will more than likely do it for you. Test out the keyboard layout that you have chosen by typing into the box provided. Specifically try out symbols such as the dollar sign, pound symbol, hash tags, speech marks, slashes and other special characters as these are the keys that tend to move around on a keyboard. The final step is to create a default user. Enter your name and give your computer a name. Enter a username into the box provided and choose a password and repeat it. Click on the “Require my password to log in” option. I don’t really recommend anyone letting their machine log in automatically unless it is a virtual machine used for test purposes. When the process has finished you will have the options to continue test or to restart now.Click the “Restart Now” option. You will be asked to remove the USB drive and press enter. Now when your computer reboots you will have options to boot into Windows 10 or Ubuntu. Try them both out and hopefully you will have successfully installed Ubuntu alongside Windows 10.Check out my new guide which shows how to show common applications such as Chrome, Dropbox and Steam easily in Ubuntu.